This one was a favorite for my hand knitting several years ago. We used him for motifs on pillows, summer time cotton knit tops and so much more. The kids loved Froggy!! He's marching into spring and will also march right into your heart. Knit Graph (and DAK File) both measure 56 stitches x 68 rows. On a scale of 8 st x 11 rows, your finished knit Froggy will measure approx. 7" wide by 6.1" tall. If you machine knit, this pattern works well as a motif on the front of a sweater or as part of a panel in an afghan or child's bedspread. 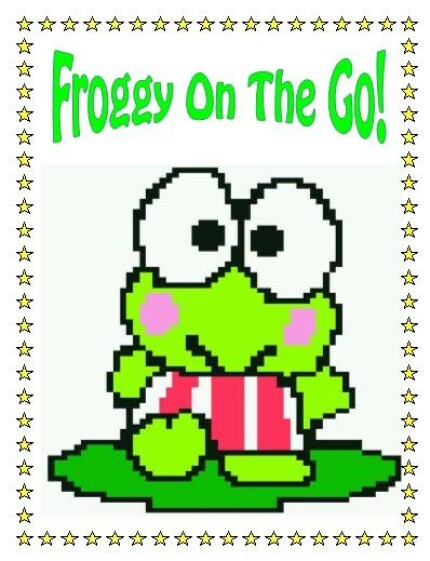 I've seen Froggy knit onto a bib, too!